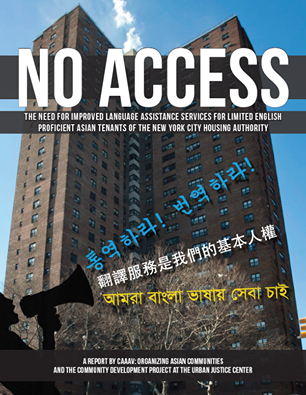 This report by CAAAV and the Community Development Project of the Urban Justice Center documents the experiences of low-income, limited-English proficient Asian public housing residents, and the barriers they face to receiving adequate language access services from the New York City Housing Authority (NYCHA), including interpretation, written materials and access to repairs. With 20,000 Asian residents, Asian immigrants are a fast growing community moving into public housing citywide. We want to ensure language justice and engagement of the thousands of limited English proficient residents in the larger fight to improve conditions, build community, and preserve public housing. Of Asian public-housing tenants who had a need for written translation of a housing-related document, fewer than 1 in 5 (18%) connected with NYCHA to request services. Of non-English speaking tenants who called the Customer Contact Center (CCC) to request a repair, more than 70% had not been able to talk to someone who spoke their language. NYCHA has a small language access staff–only six people for the entirety of NYCHA population (over 400,000 people). Only two of these staff people speak an Asian language (Cantonese and Mandarin). Our NYCHA tenant leaders will use the report findings to launch a campaign to hold NYCHA accountable. To stay informed about their campaign, SIGN UP NOW for our newsletter.